Ellis Cowling has been an active member of NAS for more than half of his life, serving for many years on both the NAS Council and the Committee for Science, Engineering, and Public Policy. For both Ellis and his wife Bettsy, including the NAS in their philanthropic giving was essential. "The National Academies are a unique, valuable, and precious resource for two major reasons," Ellis explained. "First, the academies provide encouragement for continuous improvement of scientific understanding of the natural, built, and mathematical worlds that surrounds us. Second, the academies help our country (and other societies around the world) learn how to use scientific knowledge... for making wise public policy choices." Some years ago, Ellis and Bettsy sat down with their financial advisor to decide how they could make the most impact. 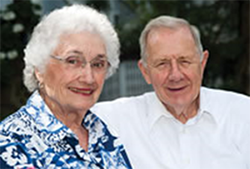 They carefully weighed what they want to leave to their children and grandchildren and decided to support the NAS with a deferred charitable gift annuity; a gift that provides supplemental retirement income to them and long-term benefits for the NAS. But, when the time came to start receiving the annuity income, Bettsy and Ellis decided the NAS should keep the entire gift and they terminated their income interest in the annuity. By giving back the annuity income, the Cowlings were entitled to additional income tax benefits. The Cowlings hope their fellow academy members will consider making annual contributions, like they do, to support the academies each year and to include the academies in their long-term estate plans to make those annual gifts permanent in the future.